Some clouds this morning will give way to generally sunny skies for the afternoon. High around 80F. Winds S at 5 to 10 mph..
Police said today that no arrests have been made so far in connection with two shootings in Atwater Village and Highland Park that left one person dead and two injured on Saturday night. The shootings happened within 30 minutes of each other, But police say the Oct. 6 incidents are unrelated. 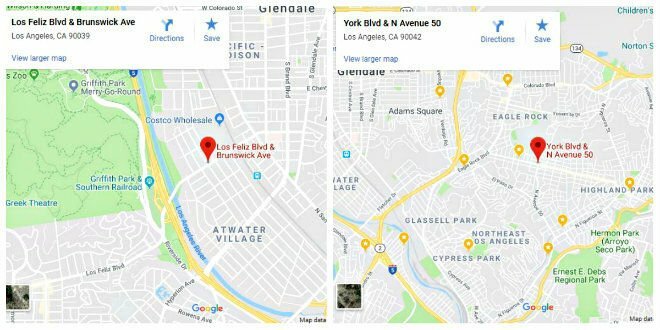 At about 10:42 pm, a man was killed during what police believe was a gang-related shooting outside a Del Taco at Los Feliz Boulevard and Brunswick Avenue in Atwater Village. The victim, identified as 26-year-old Bryan Rodriguez of Glendale, was pronounced dead at the scene. A dark-colored vehicle was seen driving away from the scene, said NBC4. About 30 minutes later in Highland Park, a man and a woman were shot near Johnny’s Bar on York Boulevard and Avenue 50 at about 11:15 pm. The occupants from a passing vehicle yelled out gang affiliations before firing multiple shots and driving away, police said based on preliminary information. Photos posted on social media showed a bullet hole in a shattered window at the front of the bar. Both victims are expected to survive their injuries Burcher said.